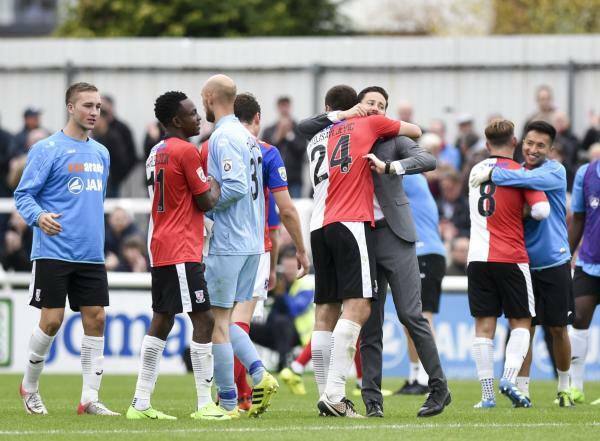 ANTHONY LIMBRICK has admitted that even Woking’s own supporters are surprised with the start they made after a 1-0 win at home to Dagenham and Redbridge on Saturday afternoon. Regan Charles-Cook scored a goal worthy of another match winner in the 76th minute, curling his strike into the top-corner to give the Charlton loanee his third goal in his last three home games. Woking stay third in the National League, just a point off the top of the league leaders Macclesfield, and Limbrick is astonished with his sides start to the season. Despite this, it was the visitors who enjoyed most of the possession and the chances in a dominant first half, and Limbrick slammed the performance of his side in the second half. Dagenham and Redbridge came into the game just a place and a point below the Cards, but were the league’s top scorers with 27 goals. Despite the first-half performance, Limbrick was pleased with the defensive work of his young side, with an average age of just over 21. Woking grew into the game with Joe Ward creating a chance in the 46th minute before Inih Effiong came on and made an instant impact, coming inches away from putting the Cards ahead. Charles-Cook may have been lucky to stay on the pitch, with a late, clumsy challenge on Dagenham captain Scott Doe, which only produced a turning point. The Charlton loanee notched a superb strike minutes later to seal all three points, but his manager raced to his defence, and was also pleased his hard work in training is paying off.